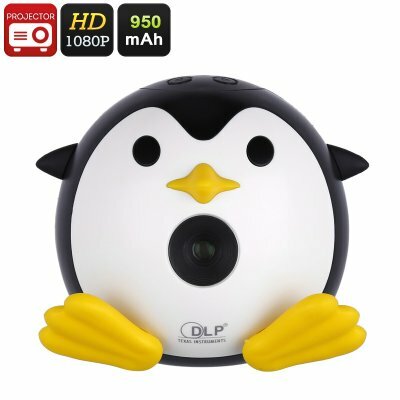 Successfully Added DLP Mini Projector - Penguin Design, DLP Technology, 40 Lumens, 1080p Support, Built-In 8W Speaker, 950mAh to your Shopping Cart. Thanks to its compact design, this mini projector is extremely portable. It can be easily carried around which allows your child to bring it along to his or her friends’ home. With its 10W LED light that produces 40 lumens, this DLP projector turns any dark room into a private theater. It supports a throw distance reaching up to 4 meters and can produce an image as large as 80 Inch. This truly lets you enjoy your favorite media to its absolute most. Your mini projector features a 950mAh battery that brings along 1 hour of playing time. Naturally, it can also be used while plugged into a power supply so you’ll be able to watch longer films from beginning to end. By supporting DLP technology, this mini projector treats you with a wide color gamut and stunning details. It supports both 4:3 / 16:9 aspect ratios thanks to which you’ll be able to watch old and new media files without experiencing any loss in image quality. With its 32GB SD card slot, it allows you to insert plenty of external media. Thanks to this, you’ll never have to worry about running out of films to watch during upcoming sleepovers or holidays. Featuring a built-in 8W speaker, it even takes away the need to plug it into an external audio device. Simply insert your TF card, hit play, and you’re ready to sit back and relax while enjoying a movie.